Pacific Shores, view sites come with a view plus 50AMP, 30AMP, Water and Sewer hook up, Cable TV, and WiFi. (Views vary, see map, some view ocean, some view forest, some view mountain and some view central park). 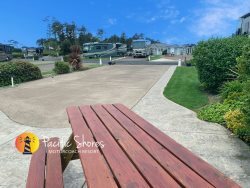 Pacific Shores View sites include 50AMP, 30AMP, Water and Sewer hook up, Cable TV, and WiFi.